My husband and I have a different marriage than most. He works out of town for two weeks and then comes home for one week. Reconnecting after a separation from work is a large part of our relationship, and is for many commuter couples, where one spouse works in a different city or state. 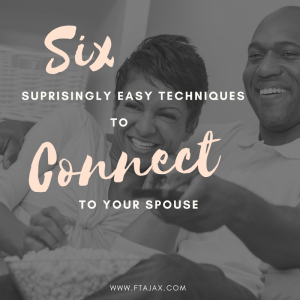 Reconnecting simply means coming back together, and can happen after a day at work, weeks apart, or after some bump you encounter in your marriage. Whether you’re in a commuter marriage, or just struggling to connect to your spouse, the research is clear: what we all strive for in life is connection. One of the lead researchers in our field, John Gottman, talks about the “Six Magical Hours” that can improve your relationship by increasing connection. Part on good terms: Before you and your spouse set out for the day or physically leave each other for a time period, make sure you understand what is going on with your spouse. Find out one thing that is going on with their day, what they are fearful of or what is exciting that day. In our home we always seal that with a kiss and an “I love you” before leaving or hanging up the phone. Reunions with a kiss: I am not talking about a quick peck and go cook supper or put the laundry away. I am talking about wrapping your arms around the one you love and locking lips for at least six seconds or longer. That may not seem like much, but time your kisses and you’ll discover that six seconds is a fairly lengthy kiss. Once you give one another a lingering kiss, set aside 10-20 minutes to have a stress-reducing conversation, where you and your partner share in the struggles and triumphs of the day. I realize that there could be a lot going on in your home but try this at the end of a long hard day at work, and you will be surprised at how connected you feel to your loved one. This signals to each other that you care about what’s going on in your partner’s life. Give admiration and appreciation: This world is filled with negativity, criticism, and pressures. Speaking kind words to and about your spouse, and focusing on the positive things can be incredibly refreshing and connecting. When was the last time you told your partner what you appreciate and admire about them? Try sharing those thoughts and feelings aloud each day, and you will be amazed at the difference breathing positivity into your relationship will do! Physical touch: Show physical affection in the simplest of ways. A pat on the back while doing some chore. A quick smooch in the kitchen while setting the table. Hugging. Kissing. A back/foot rub. Hold hands while walking or riding in the car. It’s those simple, everyday moments that continually remind each other that we are there for one another and that we love each other. Plan a date night: Life can be very hectic, so planned date nights are very important. This private time with you and your mate (not with other adults) really gives you the opportunity to enjoy one another and have FUN! We can get caught up in the business of running a household, working a job, and raising kids, that we forget to prioritize our spouse. Date nights can be simple and inexpensive, but offer you a chance to connect your mate and remain friends who have fun together. Check out our three rules for date night that we think are important for you to follow. State of the union: Plan time once a week to sit down and review the past week and the upcoming one. What is going on for each spouse and member of the household? What went well last week? What went wrong? How can I best support you and show you that you are loved this coming week? This conversation is a cross between a business meeting and a self-driven therapy session. Talk openly about what each of you need in the week to come and what you wish could have been done differently last week. This sets you up for success in establishing and maintaining connection. A great relationship doesn’t just happen; you have to nurture it, point it in the right direction and not be afraid to ask for help when you need it. If you find that you feel disconnected from your spouse or are struggling to feel that connection again, check out our other article, Six Questions To Ask Your Partner to Connect. Feel free to contact us to make an appointment to help you and your spouse get set back on the right track to a better relationship.